How can health systems deliver the right care, at the right cost, in the right setting, without overwhelming delivery and reimbursement systems with administrative burden? The shift from volume to value-based care requires the deft combination of value-based delivery (enabled through actionable intelligence and new care delivery models) and value-based payment (enabled through select provider networks and new reimbursement models). Providers and payers must operate across a transparent, administratively simple, shared ecosystem. This giant leap from today’s world might appear impossible; however, as providers take on greater accountability for cost, and share more risk with payers, there is a real urgency for change. The good news: the technological capabilities needed to affect change are available today. What’s missing: an effective bridge between the current volume-based systems, where communication between providers and payers happens after the care decision (with the limited exception of pre-authorization), and a value-based system, where rich data and enhanced intelligence are automatically shared in real-time to inform decision making. Such a bridge can be built by starting with the current, albeit flawed, pre-authorization model as a foundation, enhancing current core systems and investments rather than trying to completely rebuild healthcare. The result is a new form of utilization management (UM) that shifts the balance of interactions from post-care decision with claims to pre-care decisions. This can be done through multiple layers of seamless automation that use existing medical information systems (i.e., electronic health records (EHRs), care management portals, etc.) to minimize or even eliminate routine administrative tasks, and empower providers and payers to focus manual medical necessity and authorization review efforts only on cases that require their clinical expertise. This exception-based approach increases the value of review and authorization processes by adding evidence-based decision support to their roles. By driving communication around evidence-based practices and appropriate care at the point of decision, the industry starts to bring value-based care delivery and, ultimately, value-based payment together. Solving this practical challenge will foster genuine collaboration between payers and providers based on a shared priority to ensure that quality care for value is delivered, while significantly reducing their administrative burdens. The shift to value-based care would seem so logical and promising that nearly all stakeholders would want to support it. The reality is that current payer-provider relationships, their technological systems, and their organizational infrastructures are only now becoming ready to accommodate the transition. In the new world of value, payers and providers should be able to collaborate effortlessly at the point of care. A patient entered into the system by the provider should automatically trigger the relevant data, processes and tools needed to deliver cost-effective, evidence-based quality care. Providers and payers should know the patient’s relevant care history, which approaches and treatments are supported by the evidence, and whether those are included in the patient’s insurance benefits package and provider network. The payment of care should be administered under the appropriate reimbursement model, and providers should have shared access to the data and actionable intelligence needed to deliver the right care in the right setting. This is decidedly not the case in the traditional volume-based healthcare system. Pre-authorization and admission review are limited and often flawed examples of opportunities for payers and providers to interact and determine the clinical and financial impacts of care. Under the current approach to UM, providers must seek approval from payers for care through a cumbersome, manual and often retrospective process. This puts payers in the position of serving as guardians of cost, medical necessity, network utilization and reimbursement rules. Traditional utilization management also fails to deliver rich data on provider utilization patterns and network performance that can be shared between payer and provider. This hinders the development of improved policies, high performing networks and effective, targeted provider interventions. Not surprisingly, payers and providers view this relationship as adversarial and the traditional utilization management function as a burdensome but necessary evil, fraught with the potential for conflict. About 64 percent of physicians reported difficulty determining which tests, procedures and drugs require authorizations. About 63 percent of physicians reported waiting several days for authorization responses on tests and procedures, while 13 percent waited more than a week. Nearly all of physicians reported that eliminating authorization hassles was “very important” (78 percent) or “important” (17 percent). Although traditional utilization management tends to be universally disliked, if transformed into a new collaborative model, it could serve as a bridge to the future. Utilization management already drives the collection and aggregation of clinical and financial performance data, although it is generally not available for analyses until long afterward when claims and care management data has been retrieved and reported. That said, it is precisely this aggregation of clinical data that provides an opening for collaboration and for enhancing decision support in advance of care. 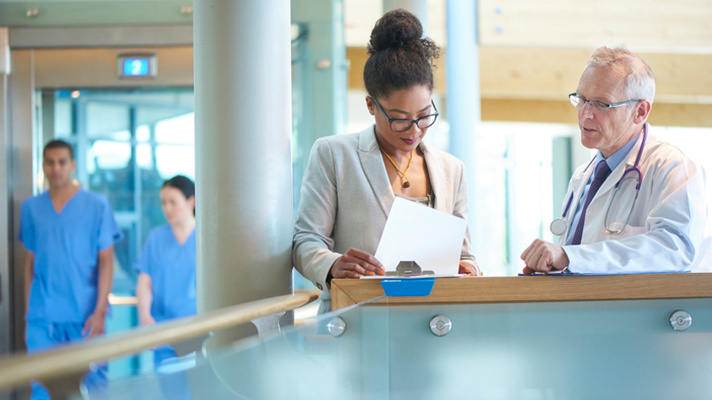 While the administrative burden of conducting a manual review is high, it is possible to automate the authorization process by integrating it into both the payer’s and provider’s workflows. This would lead to a significant reduction of the manual work involved in following up on authorization requests as well as helping to eliminate redundant medical reviews. This process could be further streamlined by programmatically extracting data directly from the electronic health record (EHR) to automatically populate the medical review. Querying the clinical record directly in this way brings obvious advantages to the UM process, reducing the administrative work required for the medical review, and reducing human errors introduced when clinicians manually copy information between multiple systems. Significantly, from the payer’s perspective, automating this process increases the trustworthiness of the review because the clinical data came directly from the EHR—the source of truth—without human intervention. And when the automated process transfers the clinical values into the medical review, that additional transparency further enhances trust. In this scenario, immediate approval could be generated based on medical review results coupled with the payer’s business rules. Automated decisions could also take into account data on provider utilization patterns and network performance. The ability to configure options based on the utilization patterns of a provider or care event is important to developing a collaborative win-win relationship between a payer and its providers. The more the provider’s practices are in line with evidence and policy, the lower the administrative burden. Both the payer and provider can see this practice data—the provider can demonstrate proficiency, and the payer can monitor and incentivize provider participation without the burden of a manual discussion. In the process, the provider will know automatically if care events are covered, what the appropriate medical and network polices are, and whether they require a deep manual review or simply a notification as they are making their decisions and before the care is delivered. To drive optimal provider adoption, this must be done across care events—diagnostics, procedures, specialty drugs, DME, etc.—and across their various payers, bringing a familiar, common workflow to the user, which is much more attractive than having to go to multiple systems for multiple payers. How does a payer continue to manage authorizations that are approved the majority of the time, without intervening in the care delivery process excessively? The data generated by automation must be gathered in a cloud-based shared ecosystem, measured and smartly managed by exception. In this way, the payer intervenes only to the degree necessary. If the provider is delivering appropriate, evidence-based care, then the burden of scrutiny should be minimized and it should be easier for the provider to deliver and be reimbursed for care. That is the formula for a collaborative payer-provider relationship and one needed for value-based care. To understand when interventions can be minimized, payers must measure and manage utilization patterns, while refining policies and processes. Measure Measuring utilization data requires examining it in aggregate as part of an overall trend, rather than in terms of individual authorizations. Doing so makes apparent which requests are being automatically approved and which are automatically reviewed or canceled, and how frequently such interventions happen. This can be done based on the plan, product, provider, patient or care event. Manage Drilling down, payers can compare utilization patterns of different networks and providers, and observe variations in care events and procedures. Accordingly, the health plan can identify outliers where requests are higher volume compared to the peer-set norm, in or out of network, or not in line with evidence-based approaches. In addition, it can also see when requests are routine and do not warrant additional scrutiny that would waste administrative resources. Based on this data analysis, the health plan can build a nuanced exception-based approach by refining and optimizing its rules of authorization to facilitate the approval of requests that are aligned with quality and cost objectives while triggering notification in the system to scrutinize requests that are outside of their set parameters. Refine Once a system is in place to automate routine requests and signal alerts about outliers, the health plan and the provider can work together to understand the root causes of the outliers and intervene as appropriate. Ultimately, this collaboration can result in improved performance for the system from both administrative and medical cost perspectives that benefit the provider and the payer alike. This can also serve as key performance data for value-based relationships between them. The more providers can align their care practices with the benefits and policies of the payer, the more providers will avoid the administrative burden of utilization management and be better able to demonstrate their value to a payer’s narrow network. In a value-based system, we are striving toward collaboration. How can exception-based utilization management be implemented, and what are the benefits of this model for both parties? In this system, payers and providers communicate about care delivery in near real-time and learn to develop a more nuanced understanding of utilization patterns and variations in care. Over time, payer rules and actionable content can be infused into the many points of decision that are being made by the provider. This will help determine the appropriateness of medical care while also reducing administrative burdens. Most significantly, it creates a traversable pathway to a value-based care system. This approach engages providers and payers with a common language. They are using a shared technology to measure, manage and refine quality care delivery in line with coverage policy. It reduces barriers internally, and between payers and providers, so that the various functions can communicate across traditional silos. Eventually, this also opens the door to integrate shared rules into the provider’s workflow. This is an essential bridge from volume to value. When utilization patterns and the benefits of improved performance are shared openly, the provider can organize its care delivery to drive value, and the health plan can incent or support such efforts by paying for value. Over time, payers will direct more care to the best performing providers, as defined by their ability to meet quality and cost goals in accordance with evidence. The best providers will work to increasingly align their practices to meet the payer’s definition of value. A transformative system is well within reach. It starts with the technology tools and platforms being developed today, and the collaborative ecosystem forming among the network of payers, providers and vendors across the healthcare space. By fully automating the authorization process, redundancy—where both payers and providers perform the same medical reviews—can be eliminated, and authorizations can be provided without needing to manually handle the request. This helps reduce administrative costs, speed authorizations, and helps ensure appropriate care. Exception-based UM is now a reality, and the elimination of the adversarial relationship heralds better days ahead for payers, providers and patients. Nilo Mehrabian has more than 25 years of experience in the healthcare market, serving the last 20 years in healthcare IT. She is responsible for the Decision Support products at Change Healthcare.